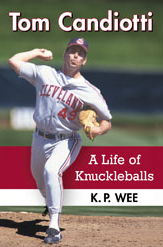 KP Wee, author of “Tom Candiotti: A Life of Knuckleballs,” is a writer and journalist from Vancouver, Canada. Currently, KP is the BC correspondent for Midget AAA Canada, serving as the reporter and editor for MidgetAAACanada.com’s coverage of major midget hockey in the province of British Columbia. He also has a food blog titled Let’s Eat Out Once a Week. Prior to this book, KP wrote “Fess Up, Jessup!” – a collection of three short thriller stories. A review of that “Fess Up, Jessup!” can be found here. He has also published other sports-related titles and fiction on lulu.com. All of the posts on this website are written by KP. If you’d like to get in touch with KP, send an email and he will get back to you as soon as he can. You can also visit his website at kpwee.com. Tom Candiotti, the subject of the biography, is a former Major League Baseball player who pitched for 16 seasons in the big leagues. Candiotti pitched for the Milwaukee Brewers (1983-84), Cleveland Indians (1986-91, 1999), Toronto Blue Jays (1991), Los Angeles Dodgers (1992-97), and Oakland Athletics (1998-99), and was known for throwing a knuckleball. One interesting tidbit not widely known about Candiotti is that he was the second player ever to pitch in the major leagues following the now-famous Tommy John surgery, behind only Tommy John. In fact, Candiotti was the first player to ever make his debut in the majors after having had the surgery. Candiotti won 151 games in his major-league career, recording 1,735 strikeouts and a 3.73 ERA over 2,725 innings. Including his time spent in the minor leagues, Candiotti won a total of 198 games in professional baseball. He was second in the American League in earned-run average in 1991 with a 2.65 ERA, trailing only Roger Clemens (2.62). He also threw a pair of one-hitters for the Indians in 1987. Following his playing career, Candiotti became a broadcaster and has worked for ESPN as well as the Toronto Blue Jays. He is currently a radio color commentator for the Arizona Diamondbacks. Here is a video on Candiotti put together by West Coast Conference (WCC), which inducted him into their Hall of Fame in 2012.